As the governor of Alabama and a presidential aspirant, George Corley Wallace did battle with the Civil Rights Movement and defied federal efforts to desegregate schools in his state. His fight against school Integration pitted him against federal courts, troops, and the administration of President john f. kennedy in a showdown over federal authority. Such stalwart convictions lionized Wallace in the hearts and minds of southerners and helped launch an increasingly successful national political career. While scoring victories in the 1972 Democratic presidential primaries, however, he was left partially paralyzed by gunshots from a would-be assassin—an incident that precipitated a political metamorphosis in Wallace. Though he failed to gain the presidency, he continued to serve the state of Alabama until 1987, when poor health forced him to leave the office after four terms and 17-and-a-half years. Wallace was born August 25, 1919, the first of four children of George Wallace Sr. and Mozelle Smith Wallace. Only a few hundred people lived in his birthplace, the small town of Clio, Alabama. His father weathered the Depression by leasing land to sharecroppers, although the family never had much money. Wallace was encouraged by his father in two areas: politics and boxing. At the age of 15, he became a page in the Alabama state legislature. A good student, athletic and popular, he finished high school as his senior class president. His punch served him well, too, and in 1936 and 1937, he won the Alabama Golden Gloves Championship. In 1937, Wallace entered the University of Alabama, with only two shirts and the desire to have a career in politics. He took four jobs, finished his degree, and remained at the university to study law. He earned his law degree in 1942, and enlisted in the U.S. Army Air Corps for pilot training. Soon after, a near-fatal case of spinal meningitis ended his dreams of being a pilot, but in World War II, he went to the Pacific as a flight engineer on a B-29 bomber called The Sentimental Education. After the war, Wallace's political career quickly took off. His first appointment was as state assistant attorney general. Then, in 1946, at the age of 27, Wallace won election to the Alabama House of Representatives. He soon established a high profile, twice being voted an outstanding member of the house. Wallace sponsored a number of liberal bills. He supported legislation that provided Social Security for county and municipal employees, created junior colleges and trade schools, and offered free tuition to the widows and children of men who had died at war. Drawing on his name recognition as a legislator, Wallace ran for a judgeship in 1952, winning election to Alabama's Third Circuit Court. "We haven't been against people. We've been against big government trying to take over and write a guideline for you and tell you how to cross the street, what to do with your union and your business when you know how to do it yourself." In 1958, Wallace launched his first gubernatorial campaign. This election would be a turning point in his politics. Wallace's chief opponent in the Democratic primary was state attorney general John Patterson. Both candidates favored Segregation, but Patterson's campaign had an edge: it was backed by the Ku Klux Klan. When Wallace lost the election by nearly 65,000 votes, he vowed publicly never again to be "out-segged." After spending four years in private law practice with his brother Gerald, Wallace returned to politics in 1962 to run for governor again. This time, his opponent was former governor James Folsom. Wallace won the election and took office just as the Civil Rights movement was gaining momentum. Wallace and other segregationists were determined to keep the civil rights movement out of Alabama. When martin luther king jr. and his fellow activists set out to integrate the city of Birmingham in 1963, violence met them repeatedly. Birmingham police officers unleashed water hoses, dogs, and clubs on the demonstrators and then Wallace dispatched the state troopers. Wearing steel helmets painted with Confederate flags, this force entered Birmingham with shotguns to crush the demonstration. Throughout the summer, while Ku Klux Klan members visited the governor's mansion to offer their services, there were bombings and shootings in Wallace's Alabama. In the same year a federal judge ordered the University of Alabama to allow two black students to enroll. When Wallace vowed to prevent them from entering the university, U.S. attorney general robert f. kennedy traveled to Alabama to warn him that the Kennedy administration would enforce the court's decree. On June 11, 1963, Wallace, having advised citizens of Alabama to stay away from the university, stood at a podium before the school door. Attorney General Kennedy telephoned once more, only to be told that the governor was unavailable. As reporters, photographers, and police officers watched, Wallace held up his hand to prevent Vivian Malone and James Hood from entering. Then he holed himself up inside the school for four hours. Meanwhile, President Kennedy federalized the Alabama National Guard, which then moved in and forced Wallace to abandon his "schoolhouse stand" and admit the students. In 1964, Wallace sought the Republican Party's presidential nomination. He did well in two early primaries, but the endorsement went to Senator barry m. goldwater, of Arizona. Wallace ran again as an independent in 1968, with moderate success, and sought the Democratic nomination four years later. In this race, he swept aside challengers such as George S. McGovern, hubert h. humphrey, and John V. Lindsay in the Florida primary. But he would not complete the race. On May 15, 1972, moments after giving a speech at a Laurel, Maryland, shopping center, Wallace was shot five times. His would-be assassin, Arthur Bremer, was caught, convicted, and sentenced to 53 years in prison. The shooting left the governor paralyzed from the waist down. It also began a provocative transformation of identity. Reelected as governor in 1974, and serving consecutive terms until his retirement in 1986, Wallace gradually retreated from his segregationist views, admitting that he may have been wrong all along. Poor health forced Wallace to forego running for a fifth term as governor in 1986, but he left a legacy far different from the one suggested by his first term in office. In contrast to the obstinate figure blocking the door to the University of Alabama, he had become a leader recognized for lasting contributions to both blacks and whites. Wallace appointed several African Americans to important state posts. He also helped to establish a statewide junior college system, increased state aid to black universities, increased support for inner cities, and improved industrial development. Wallace's health continued to decline and for several years he suffered from Parkinson's disease. Wallace died at the age of 79 on September 13, 1998, in Montgomery, Alabama. At the time of his death, many of his political appointees still held statewide office. Carter, Dan T. 2000. The Politics of Rage: George Wallace, the Origins of the New Conservatism, and the Transformation of American Politics. Baton Rouge: Louisiana State Univ. Press. Lesher, Stephan. 1995. George Wallace: American Populist. Reading, Mass. : Addison-Wesley. ——. 1994. 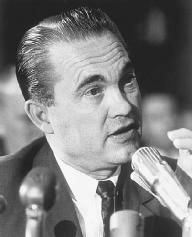 George Wallace. Reading, Mass. : Addison-Wesley. Wallace, George, Jr., and James Gregory. 1975. The Wallaces of Alabama. Chicago: Follet Publishing.